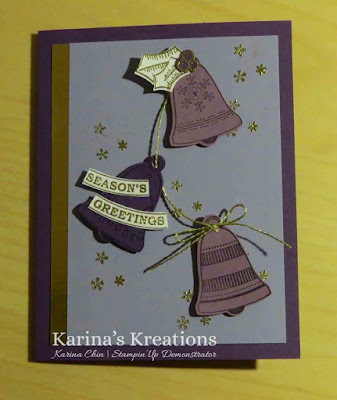 Karina's Kreations: Seasonal Bells Card! This is the last day of the Online Extravaganza! 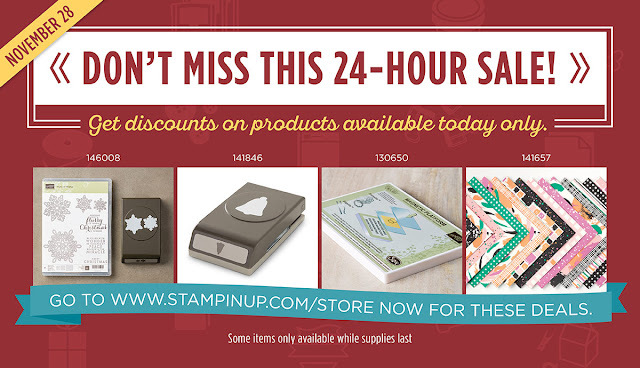 Today only, these items are also on sale. I designed this cute card to show you how the Bell Punch#141846 (40% off) and Holly Berry Builder Punch #141843 (40% off) work together. I also used the Seasonal bells #142107 and Greetings From Santa #143269 stamp set. The gold twine is part of the Baker's Twine Trio Pack #141999. All online orders placed during the Online Extravaganza will recieve three hand stamped cards from me as a special thank you. Thanks for looking at my blog!!! !